This issue opens with Thor flying high above New York City and musing that it feels like he’s come home, even though he isn’t Donald Blake any more. Thor lands at Avengers’ Mansion where he is greeted by a couple of punk, and I mean clothing style, girls. They ask his why he doesn’t trade his long hair for a Mohawk, to which he responds, “…were I to cut my hair, my helmet would fall off.” The next panels were blank in the original comic due to what they would have shown. In Thor 342 these panels were printed in the letters page, showing Thor and the Avengers racing to Central Park to get caught up in the Secret Wars. We cut to a subway station “…where even the cops don’t go alone.” Lorelei, having just gotten off the train, is accosted by two young men. She persuades them that if they fight, she might go home with the winner. She walks away from the fight and into a disused tunnel. Here she finds the dragon from the end of the last issue and tries to use her persuasion powers on him. This backfires, however, as dragons have more power in this area than she does and she quickly falls under his spell. Weeks go by and we find Thor arriving at S.H.I.E.L.D. Headquarters to ask for help in creating a civilian identity. Thor is interrupted when he hears someone call his name like they used to a thousand years ago. He shakes this off and Nick Fury introduces him to The Costumer. What this disguise expert comes up with is Thor in a ponytail, t-shirt and jeans. Fury gives Thor a pair of glasses to complete the look, which Thor isn’t all that sure of. As they exit Fury’s office, Thor accidently knocks over a reporter named Clark who, as he fixes his glasses, thinks Thor looks familiar, but dismisses it. Back in Asgard, Odin summons Hugin and Munin, his ravens, so that they might fly into the demons’ domain and see where they came from. He carves runes onto their feet and they grow to massive size. On Earth, Thor, in his new identity of Sigurd Jarlson, applies for a construction job with Nick Fury’s cousin. The application process is interrupted when someone discovers a woman tied to the crane’s hook about 10 stories above the ground. Thor leaps into action and scurries up the half complete building as the ground starts to shake and the crane begins to topple. Thor catches the woman and hits the ground just as the dragon, which recognizes him, bursts from the river and collapses the building on top of Thor and the woman. As the building is falling around them, Thor takes out Mjolnir, which he had been carrying in a bag, and creates a void in the rubble. He places the woman down and strikes Mjolnir on the ground, changing his clothes into his costume. Thor attacks the dragon, who we find out is Fafnir, former king of Nastrond, who Thor had buried deep in the earth ages ago. We cut again to Asgard, where Volstagg is searching for Balder, who is in the process of leaving Asgard as any company, no matter how friendly, has become a burden to him. Since Agnar’s attack in Thor 338, Balder has made up his mind to lose himself in the wilderness. Luckily, he thought to stock is larder to delay Volstagg and make good his escape. This is all observed, through a scrying device, by Karnilla, the Norn Queen, who wishes to take Balder as her consort. Thor, back in his disguise as Sigurd Jarlson, digs Lorelei out and is hired by Jerry, the site foreman. Lorelei briefly wakes up, notices she has a rescuer and then falls back asleep. Thor, meanwhile, hears the voice calling him again and this time he vows to find its source. Where it comes from: Fafnir is best known from the Völsunga saga, and Wagner’s Ring Trilogy which is based on that saga. A greedy dwarf, Fafnir killed his father to obtain the cursed wergild that Odin had paid the family for the death of Fafnir’s brother, Otter. Fafnir then transformed himself into a dragon to guard his treasure, but was later killed by the hero Sigurd. 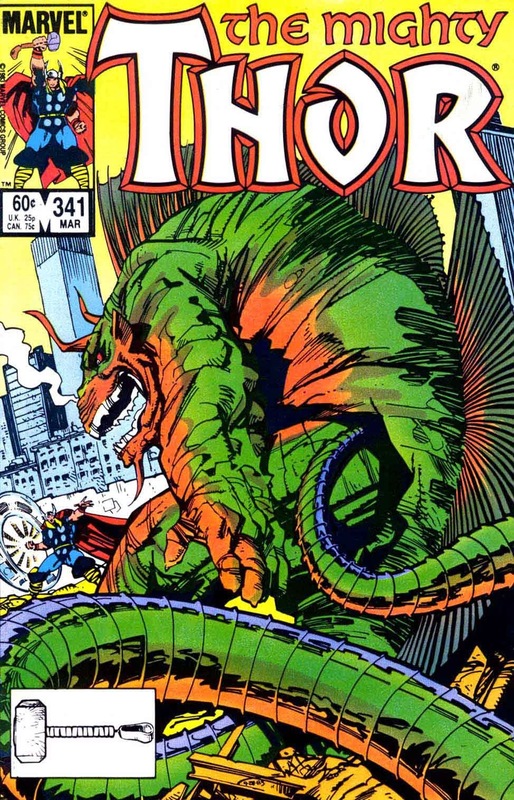 In the Marvel Universe, Fafnir was the ruler of the wicked kingdom of Nastrond. Odin destroyed the kingdom, leaving Fafnir to die in the remaining wasteland. Fafnir, however, drank water from an enchanted spring that changed him into a vengeful dragon that Thor eventually defeated, trapping him until he was released in Thor 339. Karnilla is a character made up for the Marvel Universe way back in 1964. She has been an enemy of Asgard since the beginning, but her infatuation with Balder has usually kept her from succeeding in her schemes, even when teamed with Loki. She will begin to play a much larger part in Balder’s life very shortly. 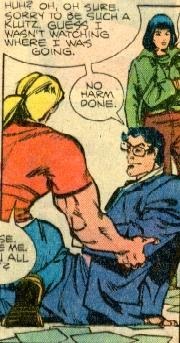 This would not be the last time Simonson had a connection to the reporter in the blue suit. In 1992 he wrote and illustrated Superman Special #1, which was a retelling of a Silver Age story. In 1999 he wrote Superman: Last God of Krypton and then in 2007 he drew Superman #666.